Whether you are just beginning your new self storage adventure or you are a Self Storage veteran, this course is for you! We are constantly updating and upgrading the C.S.S.A. 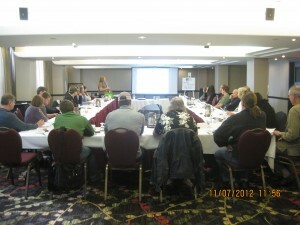 Operators Certification Course to keep up with the ever changing and growing Self Storage industry in Canada. This course is made up of the following four segments and is currently available at each of the C.S.S.A. Canadian Events. Segment 1 Sales and Marketing – Implementing an effective and strategic marketing plan. This should be attended by everyone and anyone to help to understand the best way to fill your self storage facility. you will not only have some guidance on where to spend your advertising dollars, but how to turn those calls into customers! Segment 2 Operations on the Front Line – This segment covers everything you, your managers and staff could encounter in a day from dealing with bad debt, interacting with customers, potential problems and theft, and everything in between! Segment 3 Operations – Daily Management – This segment covers all issues from hiring the right people, how to weed out the bad before you hire them. HR issues. Steps in handling the final stages of a delinquent customer and so much more. This is a must for all owner-operators, property managers and district managers, but would be a benefit to any manager to understand the business better. Segment 4 Understanding Self Storage Accounting and Budgets – Although successful owners should know most of this already, managers who understand exactly how much it costs to make the phone ring are a greater asset. We are not going to teach you about tial balances and bookkeeping here. This is a simplified course teaching the understanding of accounting and reporting in our industry. This is the only truly Canadian Operators Certification Course and is a fantastic way to improve your business and it is a comprehensive way to train and retrain your staff quickly and at minimal cost. Upon the completion of all four segments there will be an online O.C.C. Examination and upon successful completion the Canadian Self Storage Association will issue a Certificate of Merit and Completion Recognition! Spaces are limited so be sure to register today! Early Bird discounted prices end on OCTOBER 5, 2018! Please call the hotel directly at 1-800-661-8793 and request the Canadian Self Storage Association (CSSA) guest room rate.